Before you shout me down - just hear me out. I live in a joint that is kite surfing central. I have sailed here a couple of times but it is shallow and very tide dependant. Where I like to sail is a 40 minute drive. Done the drive a number of times only to have very marginal conditions. So I am thinking to get myself some kite gear for the 10 to 15 marginal days to have some fun down the road from home. Anyone else given kiteing a crack and does when the wind is not quite there to sail? From my observation kites are good when the water is shallow but the wind is good. When the wind is light and the water is shallow kites still need wind, they don't seem to go upwind in really light wind. Post on the kite forum for an expert response. Lightwind shallow windsurfing needs a longboard or sup with a short fin or weed fin.. shallow water strong wind needs short Delta type fins that don't break or stop suddenly if you start to run aground but there's no guarantee of not crashing .. twin fin setups with really small deltas are used by some sailors in strong winds. I've used a 19 Delta in strong wind and on the longboard in light wind with a little bit of centreboard down too. So if your missus doesn't put out do you go down the road? Just kidding mate . My local is probably one of the best kiting beaches in Aus, Very tidal and pretty good average wind, but nothing like WA apparently. Kiters out number windsurfers 20 to 1. I was tempted to try it to get more time on the water. I had a lesson and a second session but didn't like it. Completely different sport to windsurfing. I don't subscribe to the anti kiting thing if you're a windsurfer. Give it a go and if it gives you benefits then go for it. You only live once. One problem though is the $ involved in being set up to do both at your leisure. I'll bite, This topic always goes pear shaped on this forum and has been done before......but for entertainments sake...I swing both ways! Physically and stoke wise I get more from windsurfing, kiting is way easier physically and to do stuff like below is dead easy, (me at C/tree) if i did that windsurfing I'd be super buzzed, as its much harder to do. In the past I found there was little cross over, but now I'm often tossing up on what to do as the range capabilities of both sports equipment is so good now, it's light time to kite / windy time to sail line is often very blurred. I don't like kiting in strong winds, just too much down side when its super strong, i figure I've used a lot of my kite luck up back in the early days, so no need to push it, if its 'properly windy' I always windsurf. It's all good, if the world did more of each it would be a better place, i don't buy into the us/them thing, just make sure you get lessons, its not like windsurfing, mistakes can have massive consequences.. book in with one of the local schools. I don't enjoy sailing until it gets over 18 knots and i'm fully lit on a 7.0. (waveriding I'll go in any strength) So for the lighter seabreezes and flat water, kiting is perfect for me. We also have a number of crew down here that do the same. Windsurfing is my passion and kiting can get a bit mundane after a while, but its a good fix and gets you in the air and pumps a bit of adrenaline for a while as you learn and progress through some of the teabag moves. Key is getting a good stable kite that does a bit of everything, has really good low end and relaunches easily. I found the Airush Lithium to be a great starting kite that will allow you to progress. A 10m or 12m will get you out in 12 plus knots of steady breeze. Kiting is no real different to sailboarding when you get down to it but just different ways to enjoy the wind. I think there are considerations to think about as to which one is more suitable and they are conditions and location. If you have wind around 25 knots and more get the sailboard out but under that and I think you can get more out of a kite. If your location is shallow water, has weed or you need to carry the gear a long way to the water then kites are the way to go. I still think some of the most epic sailing sessions I have has been on a sailboard and that's most likely due to the strong wind but in SE Queensland kites rule due to the conditions I think. One way you can make kiting feel more like sailboarding is to ride a directional which I do a lot and you get the speed thrill and the need to gybe. Sailboarding for me now is getting the one design out and cruising in wind to light to fly a kite and the rest is kiting. No matter what you do its all fun.
. . . I live in a joint that is kite surfing central . . .
Based on this part of your post, my opinion is that you should try kitesurfing. That's a shocking recommendation, I know. In 2004, a long-time windsurfing mate of mine (Seabreeze member FlyingDutchy) and I decided that we should try kitesurfing. We hired an instructor for a weekend's lessons at Merimbula. I used the instructor's equipment, whilst FlyingDutchy purchased his own gear and used that. At the end of the weekend, I was in a position to decide that I would not pursue kitesurfing. The reasons for my decision are not relevant to others; it was a personal judgement. So, suggest you have a lesson or two, and then you'll be in a better position to decide. Let us know what you do. dimensions, pun intended, in foiling. I don't honestly know why you need to compare, if your enjoying sailboarding stick at it. Kiters are not out there recruiting in fact most like small numbers on the water but welcome any! I agree Kiting is probably easier to learn the basics than windsurfing from my memory of both experiences. But 90% don't do high level tricks on either. Both are difficult and risky to cross that line from the basic routine. I still see most sailboarders in my area jumping off and turning around as they haven't taken the plunge to learn powered Gybe, no big deal ride at yr level but don't think because you do a high speed run or pop a bit of a jump that you are in the 10% who rip and really take either sport to its potential. Both sports are reliant on wind and an individuals definition of what is fun for them, yes a kite board can be pretty powered over 12 knots on the right gear but many don't bother until over 15-20knots, trick riding is just that and can be adapted to flat or wave riding depends how good you are also how brave and physically fit you are. For me these days I want easy and simple, rather be out often! as its my fitness and relaxation. I used to love Cat sailing, threw in a bit of sailboarding as well. But time is precious and just as sailboarding took a lot of casual punters from Sailboat racing due to time to setup and pack up in the late 70's early 80's. Just throwing yr kite gear in plastic tub in the boot of yr car far beats loading sailboards onto roofracks or buying a van to carry it around. Trust me a big day pushing it on a kiteboard is just as wearing as big day sailboarding, cruising either is just that cruising! Both great sports and I wonder why more young guys don't take them up but just how it is. my buddy Georges now goes kiting in light wind and check what he does on the snow !! Go for it. Kiting gear more compact so easy to take both. Also buy a cheap small high wind kite board. If marginal turns 20+ knots and you can't be arsed rigging up, just switch boards. Safety note, kiting in shallow water is dangerous. Lots do it but I've also taken people to emergency with broken bones because of it. I have had 48 windsurf session this season and 22 kites. Foiling had added a new low wind alternative for windsurfing. No way I want to add a foil to my kiting gear, way too much to go wrong! I do both but kites since 2000.
save the windsurfing till I can use my trusty slalom with either my 5.3 or 5.8.
im currently lying in wait for the opportunity to put a pair of tracks on my wife's Freeride board then sneak a Zeeko windfoil through the finances. Its defiantly worth learning to kite as well. I have been windsurfing since I was a grommet and found kiting pretty easy to pick up. Its always good having the option there and I have some really good mates that only kite so its good to be able to join them occasional . But hands down I would much rather go windsurfing, often drive 45 mins down to Gerroa to sail but always pack all my gear just in case. Nothing to lose in giving it a crack. Back in the day a slalom board and a 5 or 6m sail was my goto for a fun session. 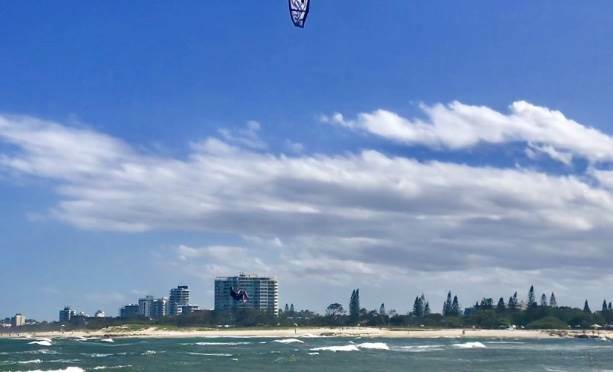 Then a few mates started kiting on the days the 6m was marginal and convinced me to take a few lessons rather than sitting on the beach waiting for the wind to come up. Completely different skills/experience with each sport, but things like reading the wind/waves/chop translates across. Ended up taking the windsurfing gear on the roof and the kite gear in the boot for a few years and just used whatever the conditions called for. If you are just looking for more time on the water it's probably a good call. Unfortunately I sold my windsurfing kit when I moved countries (kite gear was easier to get in the luggage) but every time I see a windsurfer blasting along out off Sandgate/Brighton I start thinking about getting back into it. My missus bought me a lesson as a xmas present so I finally got around to using it on Tuesday. Got the kite handling, and up on the board going in a straight line by the end - didn't get to have a crack at a turn. So I guess I will book another lesson and see how I go. One thing I have discovered is it is not cheap getting started. All the advice is you need lessons for safety which is fair enough - around the $200 for a lesson. Than if I make the plunge to buy some gear the advice on the kite forums is to stay away from the older cheaper second hand gear so for a kite, board and lines only a couple years old it does not look like I will get much change out of $1500. And of course they say a windsurfing harness can't be used for kiting so there's a another couple of hundred. But I figure it will be money well spent if it gets me on the water more often!! I remember a few years ago, people were saying not to buy kites that were more than a few years old, but I think that was then, and I don't know if safety systems have changed that much since. So, to me, that probably means kites since 2010 are probably okay, but I am sure someone can chime in with a better idea. It probably depends a lot on the individual kite as well, as I have one that is from 2007 and has the same safety as current kites. Also, as far as harnesses go, I use the same for windsurfing and kitesurfing. I can swap out the spreader bar to a 'kiting' one if I want, but so far I have stuck with the windsurfing one. You can get gear relatively cheap, but I guess it helps if someone can give you advice on if that particular kite is good for you. Kiting is 80% kite control. Practice on a trainer kite till you can literally fly figure 8s one handed with eyes closed. You should only need one lesson after that. Kiting is more $$$. Also kites and lines seem to need replacing every 5yrs or so before they become sketchy. But there are bargains around if you're willing to work for it. Check gumtree every hour or two, bargain hard and be prepared to walk away. Both my boards were under $100 ea and 1st kite $500. Your first kite will get thrashed so just get a cheap safe one. After around 2010-2012 the kite should be fine. The fabric on kites has a UV protection layer applied at manufacturing and is only really good for about 400hrs of UV exposure. for kites this amounts to about 3 years of average use. But things like pumping them up to wait for wind or washing and drying in backyard etc. eat into those hours. Plus the fabric bags out losing shape and efficiency. in last say 3 years many manufacturers have gone to using better ripstop fabrics with more ripstop strands which is proving way more durable. But to my knowledge not much improvement in the UV protection. So look to kites using these new fabrics around 2-3 years old for buying S/h. kitesurf harnesses are stronger more durable and more comfortable than windsurfing harnesses and work for windsurfing just as well. For the last 18 years I have been kiting with windsurfing harnesses only. I don't need the extra padding on the spreader bar which does nothing anyway when hooked in. If you want to do handle passes (advanced freestyle trick) then you need the sliding leash attachment at the back of the kiting harness. However, most kiters are better off attaching their leash at the front as this is safer. Conversely, when using a kiting harness for windsurfing, there are posts on here where people have claimed that the shape of the kiting hook has caused them to have trouble unhooking when under the sail. Keep going with the kiting lessons. It's easy to learn the basics and most people get a buzz very early on in the learning process. For me, I find that in flat water, Perth metro shore break and chop, or marginal wind, I have more fun kiting . I usually only windsurf these days when there are waves and 18+ knots. Although that could change when I try foiling.